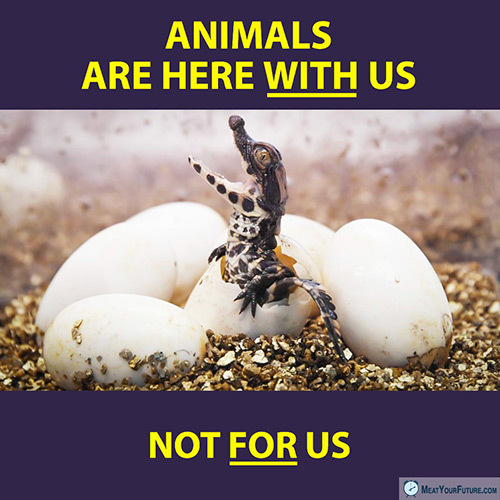 Why do we think other animals are here for our use and disposal? …that crocodiles are here to be skinned for our bags and belts; that cows are here for leather; that insects are to be crushed for food color dyes; and so on? Other animals have been on this planet long before humans even existed. They are here with us, not here for us. They do not exist for us to kill and exploit as we please, for our most trivial and unnecessary of purposes. And we humans are animals too, lest we forget. Some people seem uncomfortable acknowledging this obvious fact, and others firmly still believe that we are somehow not classified as animals. But, of course, we most certainly are. We act quite differently from other species, and we certainly don’t live in a sustainable or respectful relationship with our world. Rather, we ravenously exploit and decimate the very environment systems that support us and every other species. And, we give practically nothing back in return (except our waste, including plastics, batteries, cell phones, etc., many of which are highly toxic and last in the environment for eons). In addition, we exploit countless billions of other living, breathing, complex and sentient beings. We do so callously and unnecessarily, and for the most trivial reasons. By far, the most animals who suffer by our hands (by sheer numbers) are done so for food. We kill around 60 BILLION land animals and up to 2 TRILLION sea animals every year, for foods no human biologically requires. Please don’t support this madness, cruelty and suffering, no matter how normalized it might seem. Please use your common sense, and go vegan. It’s the least we can do if we believe other animals matter at all. Please also do what you can to tread lightly on the planet, and do what you can to help raise awareness of these issues. Are You Sleeping On His Feathers?